Festivities for the inauguration celebration kicked off early yesterday morning with a band playing live music. 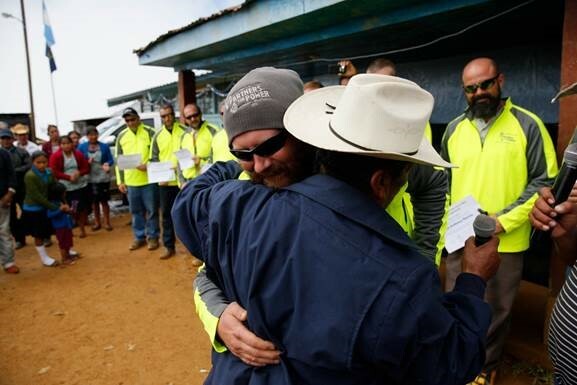 The entire village came together to celebrate the arrival of electricity in their community, and to formally thank our linemen for their contributions. There were many words of thanks, but perhaps the most meaningful part of the celebration was a symbolic gesture. As a token of gratitude, ten men from the village – including the village leader – each gave their own personal machete to a lineman. The villagers explained how useful the machetes have been to them in their lives, and expressed hope that they will find good use in the lives of the linemen, too. The linemen left the mountain with far less luggage than they brought with them. In addition to the donated goods collected by co-op employees, the lineworkers left behind many of their own personal items that they felt would be useful to the villagers, such as sweaters, flashlights and shoes. So awesome. You guys have made such a difference in this village. You should be very proud. I know we are very proud of each of you and what you have done for them. Enjoy the rest of the trip guys. Thank you for representing the members of Michigan co-ops, you have done a good thing! Great job everyone! I’m really proud of what you have done. Travel home safely. We eagerly await your return and look forward to all the stories and pictures you will be sharing. Good job. You guys are awesome!!! Great job!! So proud to be associated with such great co-op employees and great men!! Safe travels home!! You are leaving so much with the village that only begins with the lights you gave them!! God bless! !